Yay! It’s a children’s book about the joy of libraries. Aleesah Darlison’s fun rhyming poem follows a brother and sister’s day at the library. They spend the WHOLE day there and, what’s more, they do it every week with their dad. What lucky children! The poem is essentially a loving dedication to the diversity of books and stories to be found in a library. Whatever you’re into – fun, adventure, romance, discovery and more – reading a book can take you there. In this story, as the children read all sorts of books, they are transported to fantasy worlds and amazing real-world places. Turn the page and you are under the sea. Turn again, and you’re on top of a volcano. There are also lots of interesting characters to meet, including prima ballerinas and tuxedo-clad elephants. What really sets this picture book apart, however, are the illustrations. Each is by a different Australian child. This was the result of a call-out by the Wombat Books team in the form of an illustration challenge. This competition invited all young artists to illustrate a page of their choice from Darlison’s text, which was accessible via the Wombat Books website. What a great initiative! Rather than the wide range of illustration styles making the book appear disjointed, it succeeds in portraying and highlighting the diversity of the books described in the text. Yay! 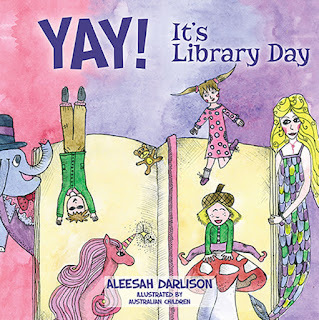 It’s Library Day is a great book for encouraging a love of language, art, books, stories and libraries in young readers.